Timber is a natural resource and the selection of fine timber is extremely important for a durable end product that combines stability, performance and aesthetic appeal. All timber used by Lymewood Architectural Joinery is sourced from renewable forests where sustainability is key. Lymewood Architectural Joinery specialises in hardwoods and will advise clients the best timber to choose to complement their property, which is hardwearing, stable and resilient. Along with using a high-quality timber in the manufacture of bespoke products we are also the supplier of a vast range of temperate and tropical timbers. Lymewood Architectural Joinery has made a significant investment to ensure it is using leading edge technology to underpin the manufacture of products. The workshop now has a window line system in place to support the production of timber windows and doors. All products come complete with a low maintenance factory spray finish in a colour of your choice. We off a range of colours to choose from, including the subtle shades (and very popular!) shades of cream, grey, green and blue. Our standard paint palette includes many popular traditional shades such as our French Grey, Cream and Off White. Many of our customers ask us to colour match paint brands such as Farrow & Ball and Fired Earth ranges which we are able to do. RAL colours and stains are both available. Lymewood Architectural Joinery also offers a two-tone spray finish to combine a mix of dark and light colours on the interior and exterior of the property. 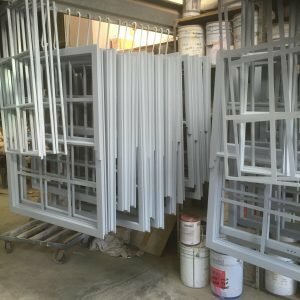 Where glazing is a feature of the joinery product clients have numerous options about the glass they would like to be installed. We use high performance double or triple glazed units. Glass available includes: leaded, double glazed, toughened, acoustic, tinted, sandblasted, bevelled, soft edge, warm edge, pyro-guard, argon and patterned. All glass can be in the form of k-glass. Glass supplied by Lymewood Architectural Joinery is compliant with Document L of the Building Regulations and has a u-value of less than 1.5, whereby there is an energy efficiency standard to be achieved in a building. 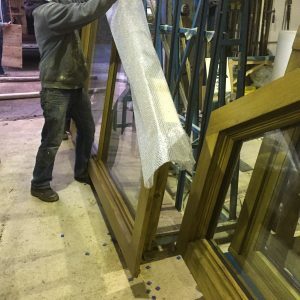 Bespoke glazing to custom designs is also possible, along with the possibility of encapsulating originally stained glazing panels into new windows and doors. Stained glass designs can be combined with obscure or patterned background glass for an additional design twist or added privacy and security. Sandblasted glass designs are also extremely popular with our customers choosing reversed out lettering or numbers, to display a house number, name, family name or anything of your choosing written in glass panels, toplights or sidelights – a fantastic finishing touch. 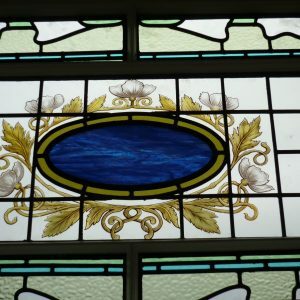 Many different possibilities can also be created with lead – this features in many of our stained glass patterns, whilst leaded designs can also be used stand alone in windows and doors – available in dark and light finishes, different sizes and jointed in different ways to recreate designs of the past or something entirely new. 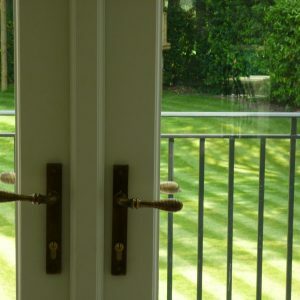 Ironmongery is available in a range of designs and styles to complement the timber product. We stock the latest range of ironmongery available on the market that combines functionality, security and aesthetic appeal. We cater for all tastes and colour schemes including polished nickel, satin chrome, antique brass and antique brass to name a few. Whilst we have a standard range of ironmongery available, we also offer ironmongery from a more exclusive range for you to choose to complement your timber products. 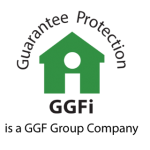 FENSA is the industry standard for replacement window and door installers self-certifying compliance with building regulations. Lymewood Architectural Joinery is a FENSA Registered Company; our registration number is 34147. When you choose Lymewood Architectural Joinery to commission your joinery products the team will carry out a comprehensive site survey to obtain exact dimensions prior to starting manufacture of products. 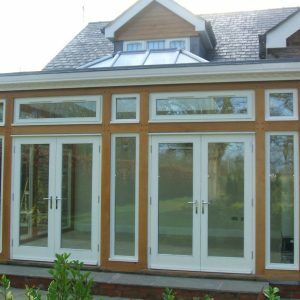 Lymewood Architectural Joinery offers an installation service, particularly where individual customers do not have builders or site joiners working at the property. All products will be packed and delivered to the site in preparation for installation. 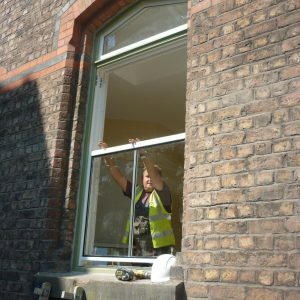 We understand the importance of timing when carrying out installation work and are used to working with other contractors that you might have working on your property. It is important that you care for your timber products to ensure they continue to look good and perform. Lymewood will provide you with guidance on how best to look after your products. Lymewood Architectural windows and doors are provided with a set of comprehensive warranties subject to minimal maintenance and checks being carried out on a regular basis by the customer. In order that the timber products continue to meet your expectations, it is essential they are properly cared for.